Parmesan Roasted Cauliflower is the BEST roasted cauliflower recipe. You will love this crispy oven roasted cauliflower with salty Parmesan cheese. It is a great low-carb side dish for any meal. 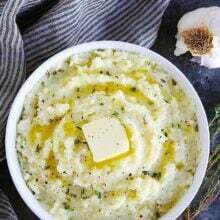 If you are a regular reader of our blog you know I love cauliflower. It is one of my all-time favorite vegetables! I love it because it is healthy, delicious, and so versatile. 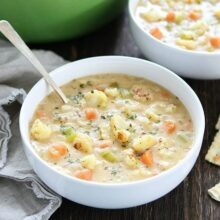 Cauliflower can be used in soups, tacos, salads, bolognese, and even grilled cheese. Probably my favorite cauliflower recipe is this Parmesan Roasted Cauliflower because it is SO easy and SO good. I make it almost every single week because it is a great side dish to any meal. It is low-carb, keto, gluten-free…if you care about any of those things. The most important thing, it is DELICIOUS! I promise you it will be your GO TO vegetable side dish. 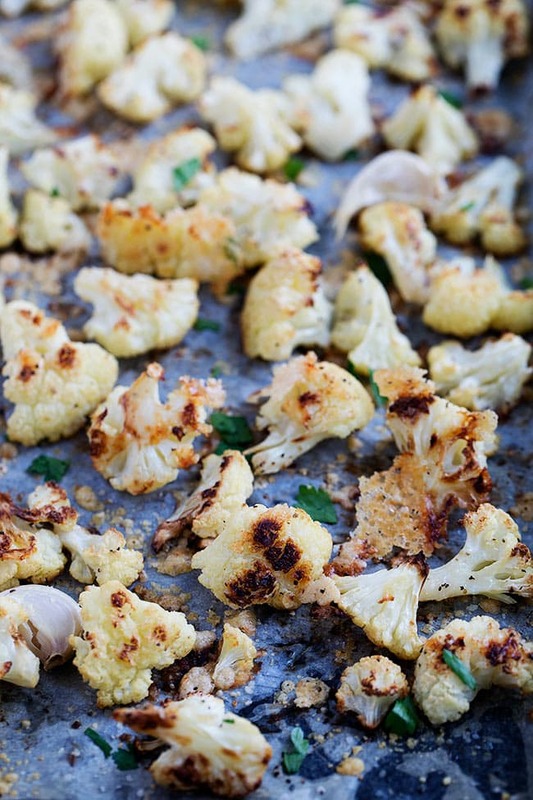 Adults and kids love this roasted cauliflower recipe! I make this roasted cauliflower recipe all of the time because it is so easy to make. When I need a vegetable side dish to go with dinner, I know I can always count on Parmesan Roasted Cauliflower. The ingredient list is short (you only need 5 ingredients) and we always have them on hand. Just make sure you use GOOD grated Parmesan cheese, not the stuff that comes in the shaker bottle. You want to splurge on the good cheese for this recipe. Preheat the oven to 425 degrees F and line a large baking sheet with parchment paper of aluminum foil, for easy clean up! Cut a head of cauliflower into florets, making sure they are all the same size. 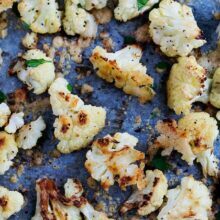 Place the cauliflower florets and garlic cloves on the large baking sheet and drizzle with olive oil. Toss until well coated. Spread the cauliflower into an even layer, making sure the cauliflower florets aren’t touching. You want to give them space so they don’t steam and get mushy. You want them to roast and crisp up in the oven. Place in the oven and roast for 35 minutes, stirring once. Remove the pan from the oven and sprinkle the Parmesan cheese onto the cauliflower, making sure all of the florets are coated. Place the pan back in the oven and roast for 10 to 15 more minutes, or until the cauliflower is crispy and the Parmesan cheese is starting to brown. I seriously could eat this Parmesan Roasted Cauliflower every single day. It is that good. I love how the cauliflower gets nice and crispy in the oven, especially after the cauliflower florets are coated in the salty Parmesan cheese. 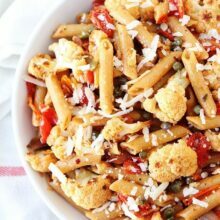 The Parmesan cheese gets the cauliflower super crispy and adds a ton of flavor! 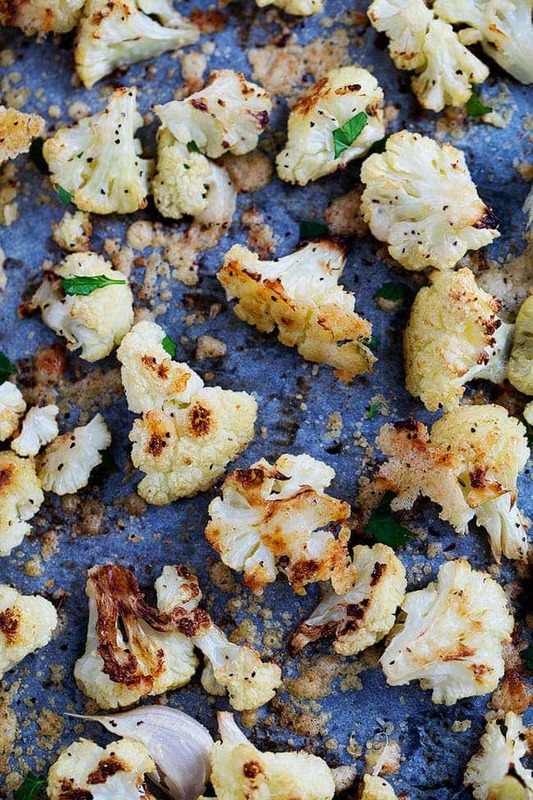 You are going to want to serve this roasted cauliflower with every single meal. Good thing it is easy to make! Preheat oven to 425° F. Line a large baking sheet with parchment paper or foil for easy clean up. Place the cauliflower florets and garlic cloves on the large baking sheet. Toss with olive oil until well coated. Spread the cauliflower in an even layer. Season with salt and black pepper. Place the pan in the oven and roast for 35 minutes, stirring once. Remove the pan from the oven and sprinkle the cauliflower with grated Parmesan cheese. 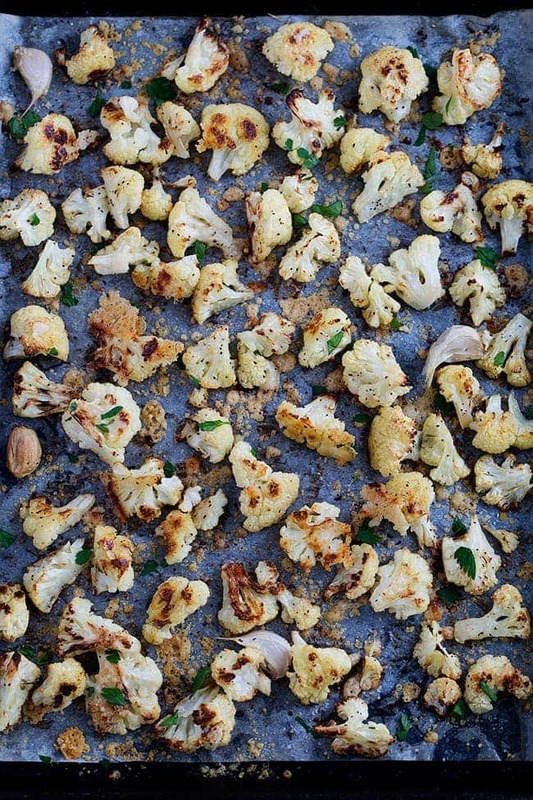 Return to the oven and finish roasting for 10 to 15 minutes or until the cauliflower is tender and starting to brown. Garnish with fresh parsley and serve warm. 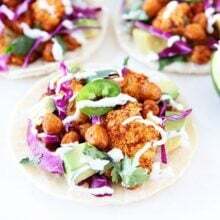 Always looking for some dressed up vegetable recipes, especially when it comes to my kiddos. Can’t wait to try this, pinned!